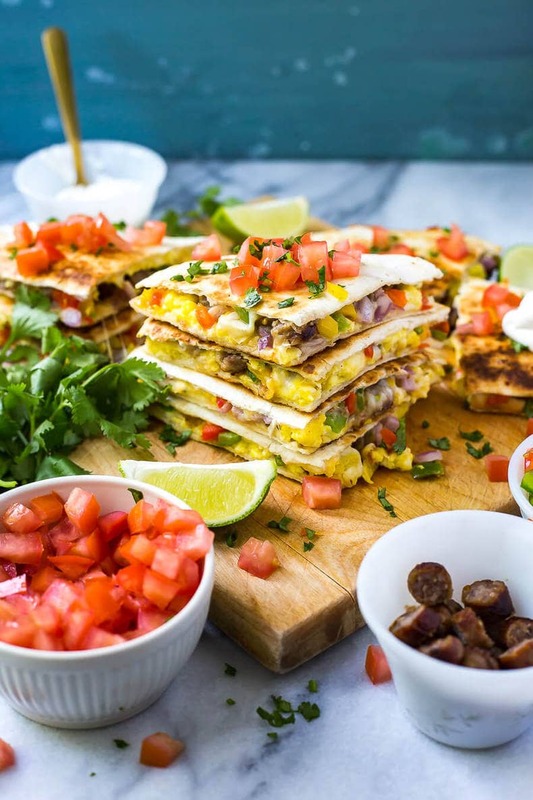 These Freezer-Friendly Tex Mex Breakfast Quesadillas with scrambled eggs, diced peppers, red onion and sausage are the ultimate weekday breakfast - throw one in the microwave and enjoy on-the-go! Heat olive oil in a large pan over med-high heat. Cook sausage according to package directions. Once cooked, transfer to a paper-towel lined plate and then slice up one cooled. Meanwhile, mix together eggs in a small bowl. Add to pan, cooking 2-3 minutes until scrambled. Remove from heat and transfer to a small bowl. Meanwhile, dice up peppers and onion until fine. Top half of each tortilla with a bit of cheese, then add sliced sausages, a bit of egg and veggies. Top with more cheese, then fold over. Cook quesadillas two at a time in a large frying pan over med-low heat for about 5-7 minutes per side or until cheese is melted. Cut each quesadilla in half and serve. They also freeze well when placed between wax paper and stored in a large resealable plastic bag. Remove one at a time and microwave for a few minutes to serve, or reheat in the oven for a crispier tortilla.